The toxicity of ZnO nanoparticles (NPs) has been widely investigated because of their extensive use in consumer products. The mechanism of the toxicity of ZnO NPs to algae is unclear, however, and it is difficult to differentiate between particle-induced toxicity and the effect of dissolved Zn2+. In the work discussed in this paper we investigated particle-induced toxicity and the effects of dissolved Zn2+ by using the chiral perturbation approach with dichlorprop (DCPP) as chiral perturbation factor. The results indicated that intracellular zinc is important in the toxicity of ZnO NPs, and that ZnO NPs cause oxidative damage. According to dose–response curves for DCPP and the combination of ZnO NPs with (R)-DCPP or (S)-DCPP, the toxicity of DCPP was too low to perturb the toxicity of ZnO NPs, so DCPP was suitable for use as chiral perturbation factor. The different glutathione (GSH) content of algal cells exposed to (R)-DCPP or (S)-DCPP correlated well with different production of reactive oxygen species (ROS) after exposure to the two enantiomers. Treatment of algae with ZnO NPs and (R)-DCPP resulted in reduced levels of GSH and the glutathione/oxidized glutathione (GSH/GSSG) ratio in the cells compared with the control. Treatment of algae with ZnO NPs and (S)-DCPP, however, resulted in no significant changes in GSH and GSH/GSSG. Moreover, trends of variation of GSH and GSH/GSSG were different when algae were treated with ZnSO4·7H2O and the two enantiomers. Overall, the chiral perturbation approach revealed that NPs aggravated generation of ROS and that released Zn2+ and NPs both contribute to the toxicity of ZnO NPs. 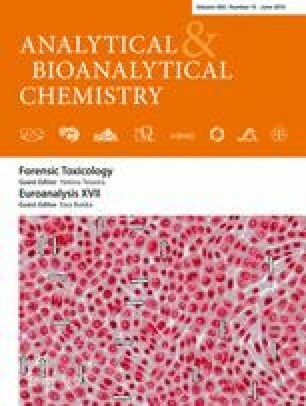 Published in the topical collection Euroanalysis XVII (The European Conference on Analytical Chemistry) with guest editor Ewa Bulska. The online version of this article (doi: 10.1007/s00216-014-7773-0) contains supplementary material, which is available to authorized users. The authors are very grateful to the Project of Science and Technology Department of Zhejiang Province (2012C37058) and the Key Innovation Team of Science and Technology in Zhejiang Province (2010R50018) for financial support.